If you’re doing well online, you’re going to have refunds. Any popular product with a high conversion rate will also have a higher refund rate. The more you sell, the more returns you’ll experience. Naturally, we are not talking high amounts of returns here, but a mere percentage or two. Don’t let refunds bring you down. Yes, refunds hurt, and they are a pain to process. But rather than dread them, become the best you can and make a friend during a refund. Process people’s refunds right away and try and find out why they made the refund. By knowing the reason for refund, you’ll have information to help you to improve. You may find out about problems you were previously unaware of. You may get good word of mouth. And you may be able to sell those customers something else because you made a prompt and cheerful refund. He sells e-books online. His books are popular, and his sales are great. He gives a no-risk, money-back guarantee. He gets about a 3% return rate. He makes returns with pleasure, thanking people for trying out his product, giving them a 100% refund, and letting his customers know that if they need any of his other products, they are welcome to try them out with no risk! He also finds out why the return was made. He finds out a lot of reason that he would never have known without asking. Sometimes he offers a different product to help his customers find what’s best suited for them. Whether he knows it or not, he makes his customers feel good about doing business with him. You shouldn’t be offended by a refund, because sometimes the product and the person are not a match. It’s not like everyone is out there to rip you off. Naturally, in every business there is a small percentage of people out there who will rip you off but if you focus on that small percentage, you are going to chase off the good customers and run your business into the ground. Are Rip-offs A Part of Doing Business? Why not consider the small percentage of rip-offs as part of doing business? Consider it an extra bill that you pay, and then move on. Focus on your good customers, not on the con artists. I have purchased many products just because I wanted to try them out. It doesn’t matter what the sales letter says I want the results I’m looking for. I try out the product. If it works for me, then I keep it. If its way off of what’s promised, then I return it and tell the person I purchased it from that the product just wasn’t for me. I have had different responses. One was a refund with no e-mail it was like they threw they money in my face. It felt like they were saying, “Here, take your money and get out.” But that was a lost opportunity because the product promised something that it didn’t deliver, and that company won’t get a chance for my business in the future. They have bad customer relations, and their product wasn’t what it was said to be. Other times, the people who e-mailed me asked if there was anything they could do to change my mind. I would simply say, “It’s just not a match,” and they would refund the money. Create cheerful returns, and create a system that will keep the customer happy while revealing important information that’ll help you identify what you can’t see. Refunds are a part of business. There is no getting around them, so do it cheerfully and get some feedback that may help you improve and make a friend when you give a refund. 1. Make a note that refunds sometimes mean that the product and the person were not a match. 2. What questions will you ask when you get a refund request? 3. What can you offer the customer a different product? 4. Is there something you can do to help the customer find the right product? For example, you may be an affiliate for similar products. 5. Create a small plan for the next time you get a refund request. If you’re doing well online, you’re going to have refunds. Any popular product with a high conversion rate will also have a higher refund rate. 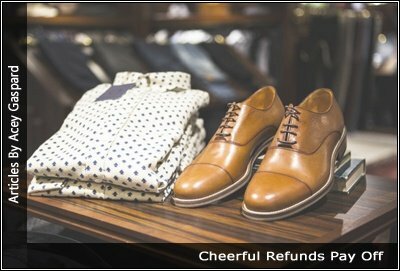 Rather than dread refunds, make your refunds easy and make it friendly. Knowing why the refund occurred, you’ll be able to find ways to improve. Refunds happen It’s not like everyone is out there to rip you off. How Quick Do you Reply To Your emails?